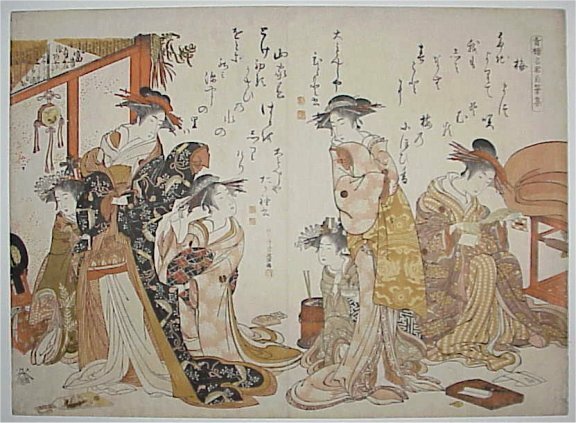 The most famous double oban design from Yoshiwara keisai shin bijin awase jihitsu kagami, “A Mirror Comparing the Handwriting of New and Beautiful Courtesans of the Yoshiwara”. Published by Tsutaya Jusaburo, 1784. One of the most important and sumptuous publications. 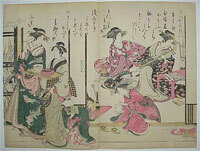 Shows the courtesans Hitomoto and Tagosode with their shinzo and kamuro. The first edition with the publishers’s address “Omonguchi” above seal and the only design fully signed. Jack Hillier’s copy of this print is illustrated in colour in his book Japanese Colour Prints, Phaidon, 1972, pl.25. Fine impression with gauffrage. Very good colour. Slight soil but otherwise very good condition. Heavy hosho. Signed Kitao Rissai Masanobu ga.
A double oban design from Yoshiwara keisai shin bijin awase jihitsu kagami, “A Mirror Comparing the Handwriting of New and Beautiful Courtesans of the Yoshiwara”. Published by Tsutaya Jusaburo, 1784. One of the most important and sumptuous publications. 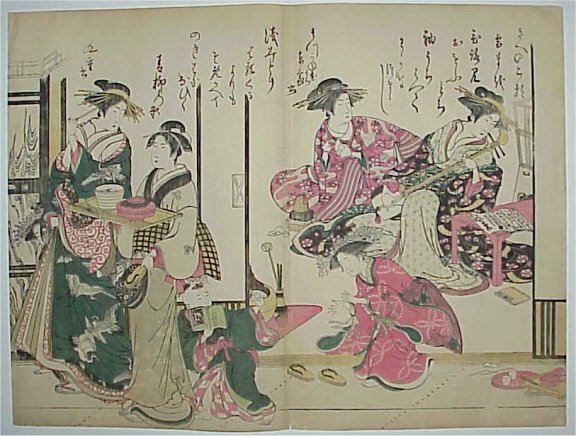 Shows the courtesans Azumaya and Kokonoe of the Matsugane-ya house with their shinzo and kamuro. Second edition with revised palette. Fine impression and colour. A few expertly repaired wormholes, otherwise very good condition.